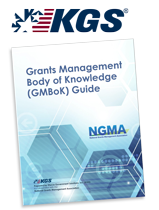 The GMBoK Guide provides an in-depth understanding of the grants management lifecycle, from solicitation to application evaluation to the closeout and audit phases. It covers the laws, regulations, and policies affecting federal guidance, while calling specific attention to recent changes for the issuing and use of public funding. 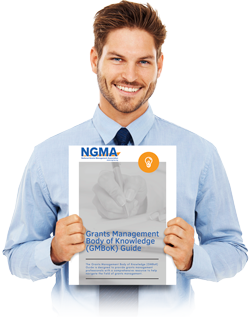 The GMBoK Guide is pertinent to grants management professionals representing every corner of grants management, including federal agencies, state, local, tribal, and territorial governments, institutions of higher education, nonprofit organizations, and the private sector. Specific application of the concepts offered in the Guide will vary by organization, by grant, and many other factors as diverse as the organizations managing them. The GMBoK Guide is built upon authoritative federal standards and regulations, including the 2 CFR 200, Uniform Administrative Requirements, Cost Principles, and Audit Requirements for Federal Awards (Uniform Guidance); the Government Accountability Office’s (GAO’s) Standards for Internal Control in the Federal Government; OMB A-123, Management’s Responsibility for Enterprise Risk Management and Internal Control; OMB A-133, Audits of States, Local Governments and Non-profit Organizations; and the annual Compliance Supplement.